Samsung had launched the Galaxy J7 Prime last year with a metal body, fingerprint sensor, 2.5D glass covering, and features like S Secure and S Battery Planning. It was launched with Android 6.0 (Marshmallow) out of the box, and the company seems to be testing Android 7.0 for the lower mid-range smartphone. 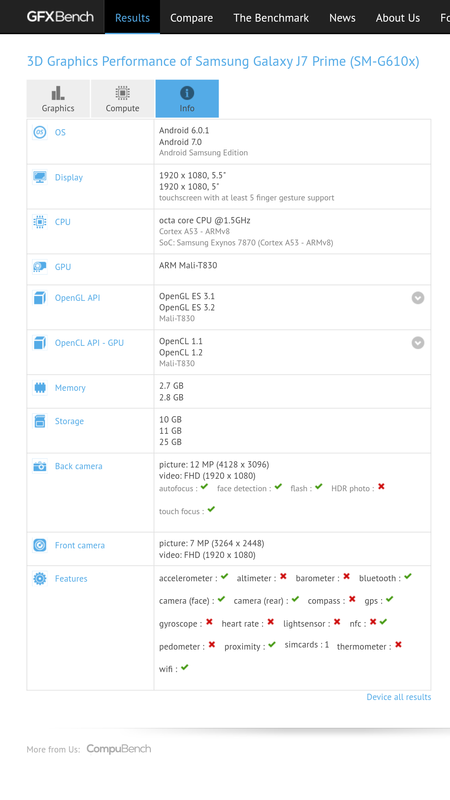 We’ve spotted a GFXBench entry for the Galaxy J7 Prime (SM-G610) running Android 7.0 (Android Samsung Edition), which makes us believe that Samsung has started testing the Nougat update for the phone. We’re not sure whether Samsung will bring a newer user interface with the update, but we hope Samsung released Android 7.0 for the Galaxy J7 Prime before Google releases Android 8.0. The Galaxy J7 Prime was launched in India last year. It features a 5.5-inch 1080p TFT display, a 13-megapixel rear-facing camera, and a 5-megapixel front-facing camera. Both cameras feature f/1.9 aperture. It is equipped with an octa-core Exynos 7870 processor, 3GB RAM, 16GB internal storage, a microSD card slot, and a 3,300 mAh battery. Thanks for the tip, Ahmed! Galaxy A8 ( 2015 ) android nuughat update ?? According to Samsung Turkey, the J5 2016 will only receive Android Nougat from September. As for J5 Prime (On5 2016), no date was set, but knowing that its predecessor (On5 2015) received an update from Android and that J7 Prime (On7 2016) will be contemplated in November, it can be said that the model will be updated soon! Are you sure ? what about your reference ? Where is the Nougat for A 2017 Series? What the hell Samsung? Are you forgot them? According to Samsung Turkey, the Galaxy A 2017 series begins to receive Android Nougat in August.